Studio portrait in front of a painted backdrop of Flora Thundercloud Funmaker Bearheart (WaNekChaWinKah), daughter of Moheek Thundercloud (MaZheeWeeKah) and Annie Blowsnake Thundercloud (WaConChaSkaWinKah). Flora is sitting in a chair covered by a silk appliqué blanket (wai) and is dressed in a fine appliqué dress (wawaje) with silver dimes attached to the skirt. 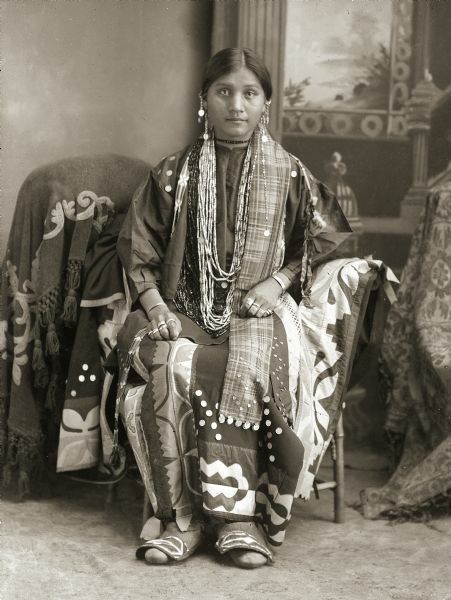 The plaid ribbon with silver coins hanging on her left side, and the strip of side-stitch beadwork (paque) hanging over her right shoulder would have been worn down the back extending from her hair wrap, but they have been brought to the front for the photograph. Small silver coins accent her blouse. The flaps of Flora’s moccasins (waukoocharah) are decorated in silk appliqué to match her dress. Many Ho-Chunk moccasins of this style have the top flaps decorated with beadwork. Appears in the books: "Wisconsin Death Trip" by Michael Lesy and "People of the Big Voice" published by Wisconsin Historical Society Press.